So, you’re looking to get the best Plasti Dip for your rims? Plasti Dip is becoming more and more popular, and for a good reason! It has proven to be a great, effective way to safely change how your car looks for a time. It can be safely applied on badges, trim, grilles, and really any part of your vehicle. We’re going to go over plasti dip for car rims though. How to Choose the Best Plasti Dip for Wheels? If you’re looking for a plasti dip for car rims, look no further! In this article I’ll be going over what’s the best plasti dip for rims, don’t miss the chance to pick on one of these great products. All Plasti Dips are the same in their essence. Plasti Dips are colored, rubberized coatings that you apply to any part of your car in a variety of ways such as dip, brush, and spray. It’s often used to coat tool handles, but as time has passed, a considerable amount of applications for it have surfaced. You can use this handy rubber coating to temporally switch the looks of your parts, like wheels. Don’t like the new look? Peel the material off! If you get tired from the finish or wish to change the colors, Plasti Dip got you covered. While Plasti Dip can be removed quite easily, it is durable and a good way to shield the original finish of your wheels (or any part of your car)! Most Plasti Dips can be found in a variety of colors, from matte red, black and white to metallic green, blue, and purple. Many services nowadays provide a “mix-your-own” kit to make a dip in the color you want! Protective: Coated items should be fully proofed from moisture, acid, abrasion, corrosion, skidding, and slipping. They will generally feel comfortable to the touch. Flexible: Your Plasti Dip coating should remain stretchy and flexible over time. Temperature-proofed: Your Plasti Dip coating should not crack or become brittle, not even under extreme weather conditions. It should withstand anything from -30°F to 200°F (-35°C to 94°C). Removable: No matter what surface, your Plasti Dip coating should be easily peelable. If not, it defeats one of the main points of it in the first place. Applying plasti dip is quite easy! You just need some soap, water, a roll of masking tape (or a cheap deck of cards you don’ mind spending), your plasti dip, and your sponge. A roll of masking tape (or a cheap deck of cards you don’t mind spending). Your Plasti Dip of course. Rinse and clean your wheels thoroughly. The more dirt, grease, and debris in your wheels, the harder it’ll be for your plasti dip to stick. Once you’ve cleaned your wheels, make sure you completely dry them! At this point, you must decide whether or not you’re going to apply your Plasti Dip while the wheels are still on. It’s easier to apply the Plasti Dip while the wheels are off, given that you can easily tilt your wheels and spray at angles that are either difficult or impossible to attain if they’re still mounted. You can still apply the coating while they’re on, it’ll just be harder to do, and you might risk leaving part of the surface behind! There are many ways to avoid over spraying, and you’re welcome to try one of your own! I personally recommend either using some masking tape around the edges of the wheel or distributing your deck of cards around the outer lip. Choose whichever way you prefer, over spraying is not a big deal, as you can easily peel it, but you don’t want to waste more product than necessary. Once you’ve masked your wheels, you’re ready to spray! I recommend using arced, evenly-paced passes. 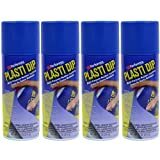 Spraying Plasti Dip is generally easier and less finicky than paint, but you don’t want to make drips or bubbles either way! Spray the first coat, it should look light, almost transparent, after drying (about 10 minutes) spray the second coat, the color should now be solid, but not opaque, let dry again and move on to the third and last coat. The color should look completely solid. Feel free to apply some extra spray to areas that might need a bit more. Let dry for at least half an hour before handling them! Read this first, if you do not your wheels to be taken off the car for Plastidiping process. This handy coating can help you in a wide array of DIY projects, whether around the home, garage, car, or workshop! There are many colors and textures to choose from. In this category, you’ll find colors such as red, blue, white, black, and cherry, but there’s also glowing colors such as green and cyan (these must be applied on top of the white Plasti Dip). If you’re looking for different layers of black, you can choose the Smoke Plasti Dip, which gradually becomes darker and deeper with each layer. If you like to go outdoors a lot, whether to fish or hunt, the Camo variants offer you inconspicuous colors that will keep your gear and equipment coated and sealed from the elements! Blaze for neon, eye-catching coatings; Classic Muscle, for bright matte colors; and lastly, Luxury Metal, for metallic, sparkly colors. You can find 11. Oz bottles for about $7 to $12 online each, but generally, buying a kit on a home depot is cheaper and more effective. 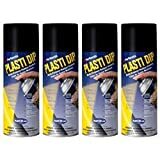 If you’re looking for a long-term automotive solution, you can opt to acquire one of these gallon-sized Plasti Dip containers, these all come in the standard colors! If you like coating your car a lot, this is the option you should go for! You can find gallons (128 Oz) online for about $63 which is not a bad deal at all. This is my personal pick. There is a series of different enhancers that were specially designed to make Plasti Dip colors even more outstanding! From the Metalizer, to add a shimmering, metallic finish. Chameleon, to add an iridescent, color-shifting shimmer over black coating. Pearlizer, to add a pearlescent luster. Satinizer, to add protection against fades, and lastly, Glossifier, to add a shiny, glossy finish that provides protection against fades. 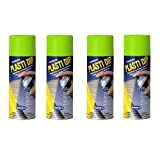 Good Plasti Dip Enhancers are kind of hard to come by online, but they’re cheaper than Multi-Purpose bottles, about $5 for an 11 Oz bottle. Many of these options are based on preference, I like metallic, sober colors such as the ones from the Camo series. Especially the camo brown one. I recommend using the Satinizer or the Glossifier Plasti Dip on top of your desired coat to ensure your dip lasts! If you don’t like the look, no biggie, you just have to peel it off!